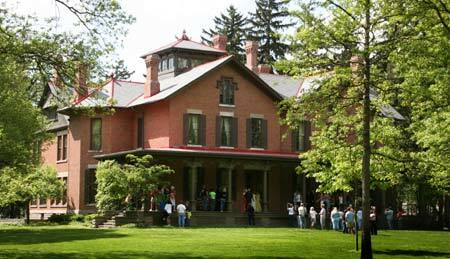 You can visit the 31-room mansion of the 19th President, Rutherford B. Hayes, see his library, estate and tomb. The main entrance of the Rutherford B. Hayes Presidential Center is located at the corner of Hayes and Buckland Avenues in Fremont Ohio. The facility consists of 2 buildings – the Hayes Home and Hayes Museum. Daily tours of both are available year-round. Visitors can opt to tour one building or both. Tours of the Hayes Home are guided and take about 45 minutes. The Hayes Museum involves a self-guided tour. However docent-led museum tours are available for groups of 15 or more by prior arrangement. The museum was started by the President's second son, Colonel Webb Cook Hayes and his siblings, shortly after the turn of the 20th century. In several transactions, Colonel Hayes and his brothers and sister deeded over to the state of Ohio, Spiegel Grove, the President's estate and all its holdings. Ground was broken in 1912 for the museum building and the first presidential library/museum in the United States opened in 1916 funded by the state of Ohio and Webb C. Hayes. Sardis Birchard was born in 1801 in Vermont. Both of his parent died when he was only 12 and so he moved in with his sister Sophia and her husband. A few years later, the Hayes family consisting of Rurtherford, Sophia, Fanny and Birchard moved from Vermont to Delaware, Ohio. Five years later, Sophia was pregnant when Rutherford died before his son was born. After the birth Sophia name her son Rutherford Birchard Hayes in honor of her husband and her brother. Birchard took responsibility for the Hayes family, insuring that young Rutherford got a proper education. Sardis Birchard was just 23 years old when he first came through the Lower Sandusky area that would later become known as Fremont. He had been delivering hogs to communities along the Sandusky River. Several years later he moved the Hayes family from Delaware to land he had purchased in Lower Sandusky. 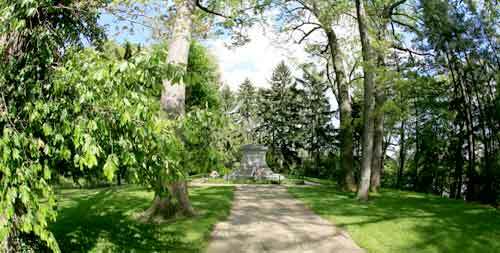 Over the years Birchard purchased numerous plots of land throughout northwest Ohio. This land proved to become very valuable. One of those plots of land was a 25 acre wooded lot located on the edge of town that he had admired. One of the things that attracted him were the pools of water that formed on the floor of the woods after a rainfall. They reminded him of mirrors reflecting light filtering down through the trees. As a child his mother had read him German fairy tales. One of those tales referred to mirrors (the German word for mirrors is "spiegel") and so Sardis decided to call this enchanted land Spiegel Grove. He selected the land as a home for his nephew Rutherford and his family. Birchard began building the brick house in 1859, but with the Civil War and political obligations, Rutherford and his wife Lucy were not able to move into the property until 1873. The Museum Store, located adjacent to the Reception Desk in the Hayes Museum, carries a variety of books for children and adults, souvenirs, postcards, and gift items relating to President and Mrs. Hayes, the Civil War, history, and the Victorian Era. The Museum Store’s boutique-like atmosphere is generated by the array of specialty merchandise that changes with the seasons. Visitors can shop the Museum Store anytime free of charge. Hours are 9 a.m.-5 p.m. Monday-Saturday, and noon-5 p.m. Sundays and holidays. Tuesday - Saturday 9:00 a.m. - 5:00 p.m.
Closed: Mondays, Christmas and New Year's Day, Easter Sunday, and Thanksgiving Day. When you enter Spiegel Grove, you can't miss the massive iron gates. Rutherford B. Hayes did not put those gates in place, in fact they were installed well after his death, but Rutherford Hayes had passed through the gates many times. These were the actual gates being used to protect the White House in Washington DC up until 1921 when they had to be replaced with wider gates to accommodate automobiles. Rutherford's son, Webb, led an initiative for the government to donate them to the Hayes Memorial. 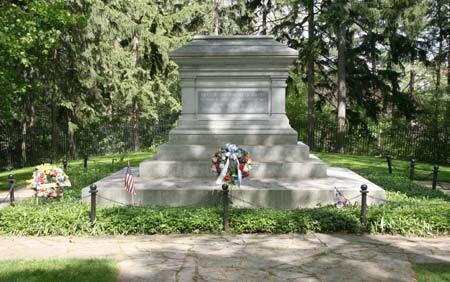 President and Mrs. Hayes are buried just south of the Hayes Home, within the grounds of Spiegel Grove. A granite tombstone, quarried from the Hayes homestead in Dummerstown, Vermont, marks their burial site.